This spring, a new book by Massachusetts senator Elizabeth Warren that will take on the decline of the middle class, how to fix it and the damage wrought by Donald Trump’s presidency. CNN reports that the book is called This Fight Is Our Fight: The Battle to Save America’s Middle Class. It will reportedly be a “mini-history” of the American middle class, along with “candid accounts of her battles in the Senate, vivid stories about her life and work, and powerful descriptions of the experiences of working Americans,” according to a statement from her publisher obtained by the AP. This book will be Warren’s 10th and some speculate it could also be a hint that the senator will throw her hat in the ring in 2020. Forbes notes that publishing books of this nature —semi-autobiographical while also shining a light on qualifications and credentials — is a good way to prepare for a presidential run. Warren hasn’t confirmed whether or not she will run, but it’s nice to have something to possibly look forward to. 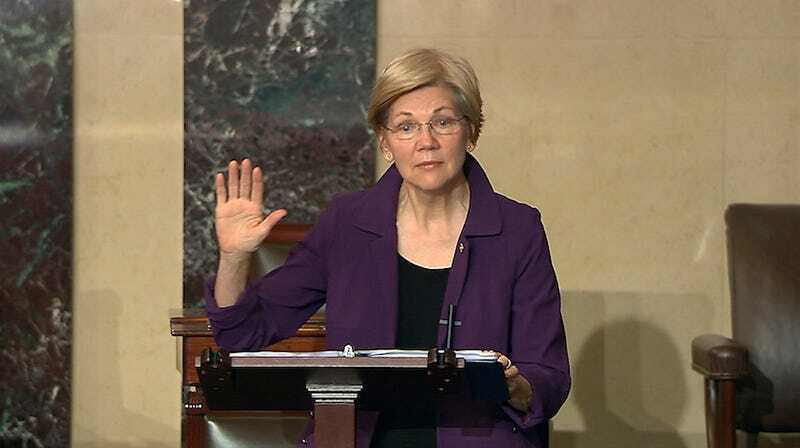 For evidence of how Warren might fare as president, look no further than this footage of her speaking out Tuesday night against soon-to-be-attorney general Jeff Sessions by reading the letter Coretta Scott King wrote in protest of Sessions’s nomination as federal judge, before Senate Majority Leader Mitch McConnell shut her down. The book will be out on April 18, just in time for any pre-summer getaways or quiet weekends spent reading something other than your Twitter feed and its attendant horrors.